Lovely confirmation keepsake! 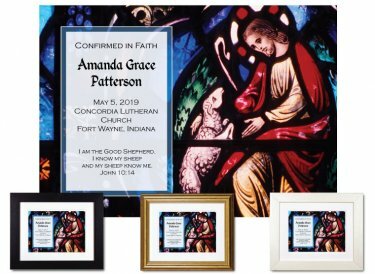 You'll personalize it with the confirmand's name, date of confirmation, church name, and the confirmation verse (or any Scripture verse of your choice) in your preferred translation. Framed & Finished - Printed on premium paper with archival inks and double-matted with conservation-grade matboard as above; mounted using acid-free foam core backing; framed using distortion-free UV acrylic glazing. A protective dust cover and wall guards are applied to the back. Your choice of black, gold, or white wood frame (view frames here). Ready to hang. Finished size: 10"x12"